Use the new BeeSpi V advanced self contained photogate to measure free fall speeds,cars and projectile velocities.Two parallel photogates detect, measure and display speeds of any objects that pass through, from zero to 99.99 km/hr,measures in m/s also. Since it uses dual photogates, speed can be found with the objects front edge! No length measurement is needed. Try positioning BeeSpi sensors at different points on an inclined plane and calculate energy transformation from potential to kinetic. 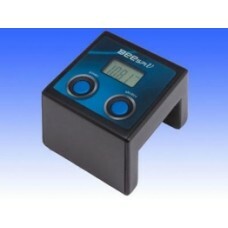 The gap is 40mm x 30mm, large enough to accommodate standard hotwheels cars and other small objects.Additional settings measure lap time and cumulative lap time, so you can use the BeeSpi to precisely measure the period of a pendulum.Single button operation, requires two AAA batteries.